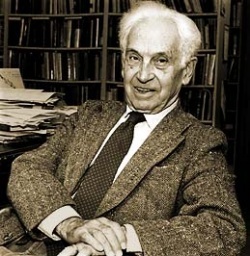 Any student of biology, or anyone with an interest in the natural world, will be familiar with Ernst Mayr who passed away on February 3rd in Bedford, Mass. Born in Kempton, Germany he joined the American Museum of Natural History as a curator in 1931. In 1953 he left the museum to work at Harvard University where he stayed until his retirement in 1975. While working on the problem of speciation in the birds of New Guinea, Mayr realized that the multitude of species and and subspecies that he saw could best be explained as being a snapshot of evolution in action. He suggested that new species could arise when the range of one species was fractured long enough for members in different parts of the range to evolve characters that would not allow individuals to reproduce when they were brought back together again. This lead to him developing the “biological species concept” in which species are defined as populations of interbreeding organisms rather than just a collection of characters. This idea, along with his theory of “allopatric speciation” was published in his book “Systematics and the Origin of the Species” (1942) and later contributed to the “Punctuated Equilibrium” theory of Niles Eldredge and Stephen Jay Gould. Ernst Mayr was himself inspired by the work of geneticist Theodosius Dobzhansky on the fruit fly Drosophila melanogaster and his book “Genetics and the Origin of the Species” (1937). These two men, together with the paleontologist George Gaylord Simpson, combined the sciences of genetics, zoology and paleontology into what is now known as “the new synthesis” that provides the modern experimental underpinning to the concepts that Charles Darwin presented in his book, “On the Origin of the Species” . For anyone interested in learning more about modern evolutionary theory I’d recommend Mayr’s recent book “What Evolution Is” (2002). It’s written in an engaging and readable format from the perspective of someone who’s thought about evolution all his life.